Track how many people have seen your items and how well your promotions are doing. 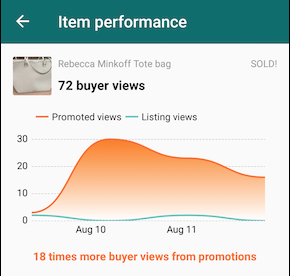 When you view your promotion results, you'll see a graph of how many unique buyers have viewed your item over time. Listing views are the unique views your item received from the original listing. Promoted views shows how many additional unique views you gained from the item’s promotional spot. The graph will also let you know if your promotion is currently running and how many days are left, or if the item has sold. Promotion results are based on promotions that have been initiated within the last 30 days. Only the most recent promotion for each item will be shown. Tap Promotion results to see results for all of your promoted items. This link will be available if you have recent promotion statistics to view. Tap Item performance. This link will be available if you have recent promotion statistics to view.